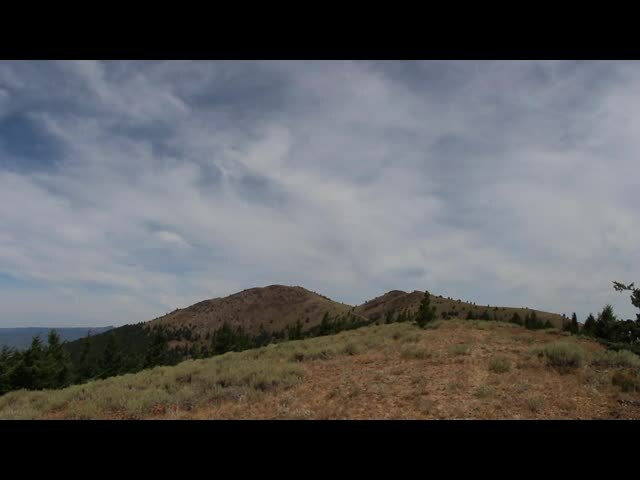 We viewed the Great American Solar Eclipse of 2017 from the 7600-foot summit of Dixie Butte in Eastern Oregon. We began planning this trip the previous summer, the moment I read about the upcoming eclipse. I’d dreamt about seeing one since I was a child, and this was going to be my big chance. So I began researching it online. Supposedly, all hotels within the path of totality had been booked three years beforehand, which was amazing. I also read that essentially everyone who has seen a total eclipse would gladly travel to see another one. It was that good. That’s a pretty strong recommendation. But it had to be a 100% total eclipse. 99% wasn’t good enough. After researching the path of totality, Vicki and I decided to merge two trips into one. We would go backpacking up in Washington State first, then head south to Oregon for the eclipse on our way back to San Diego. I put in for my vacation a year in advance, which was probably a record for the HR department, and then began planning where we would view it from. There were so many options. If we came back via the coast, there would be tons of people and traffic, and a good chance of an overcast sky. 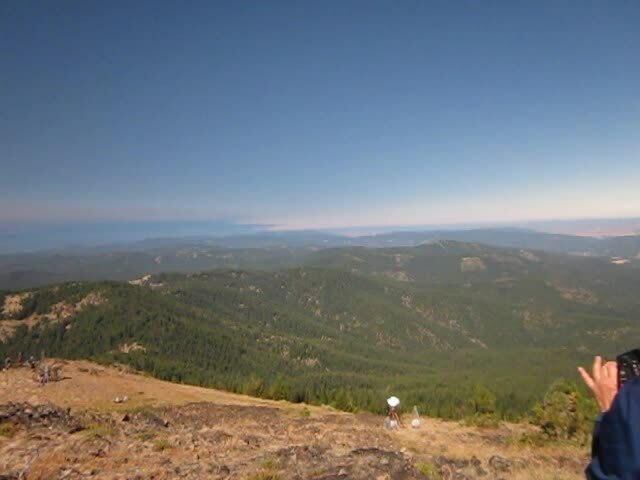 The internet also made it clear that, probability-wise, the best chance for sunny skies was in Eastern Oregon. So that localized it a bit. But with all the hotels and campgrounds reserved, where would we stay? 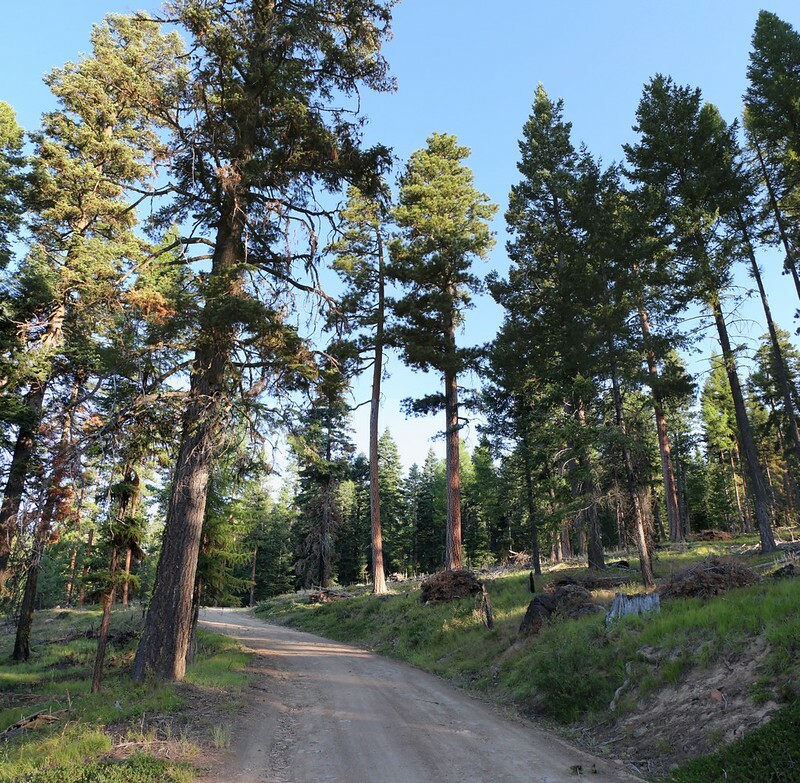 The only answer was one of the National Forests, where you can often camp almost anywhere as long as you follow a few simple rules. So I spent some time over the winter and narrowed down our choices to three or four possible locations. We had Plans A, B, C, and D. And I had maps and waypoints on my GPS for all of them. We were as ready as we could possibly be. And we also decided to beat the incoming traffic by arriving three days early. We sure as heck weren’t going to miss out on what could easily be a once-in-a-lifetime experience. 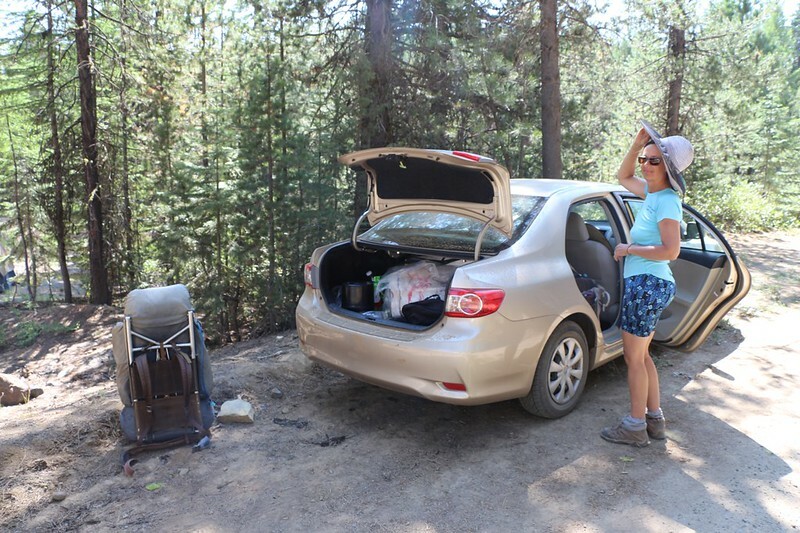 We woke up at dawn in our hotel room in Leavenworth, WA and packed the car with our gear. We were all washed and clean and happy after our previous ten-day backpacking trek, and everything had been reorganized for the next stage of the adventure. On to Oregon! It was a seven hour drive and we wanted to get there early, just in case we had to resort to Plan B, or, God forbid, Plan D. We wanted to set up our tent well before dark, so we gave ourselves extra time in case of trouble. The television and newspapers had been up to their usual tricks by way of creating a dramatic storyline, and they had hyped up the anticipated traffic problems until everybody in the United States was expecting a vehicular armageddon. 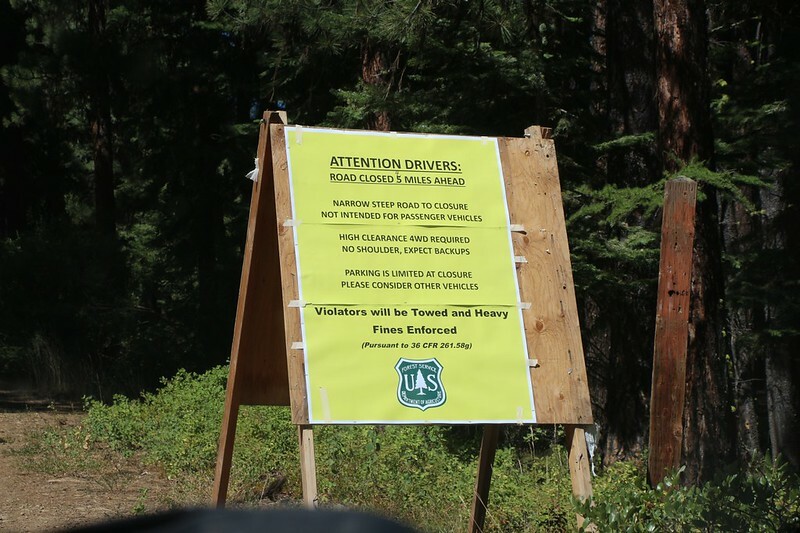 That’s why I was worried that the Malheur National Forest rangers would do something stupid, like preemptively close off one or more of the dirt roads we planned to camp near. In the name of public safety, of course. But in reality, it would make certain that the problem went elsewhere so that the rangers wouldn’t have to deal with it. So I was worried a bit as we drove south, but there wasn’t much that I could do about it. We had an enjoyable ride across eastern Washington and Oregon. Lots of farms and grassland out there along Interstate 84, which follows the old Oregon Trail. We ate lunch in the town of Baker, then headed west toward John Day and Prairie City. Vicki was driving and I was navigating with my GPS running as it had the waypoints for Plan A stored in memory. 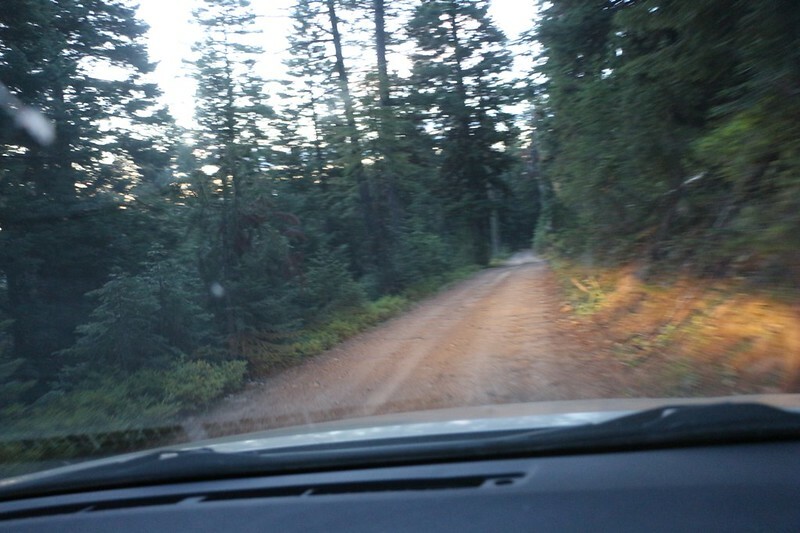 We had to turn right on a dirt road, Forest Road 2610, and then see what happened. And the first thing we saw when we turned onto it was a big new sign with the words “ROAD CLOSED” on top. Oh no! But on second reading it actually said that the road was closed five miles ahead. Whew! That was a relief! 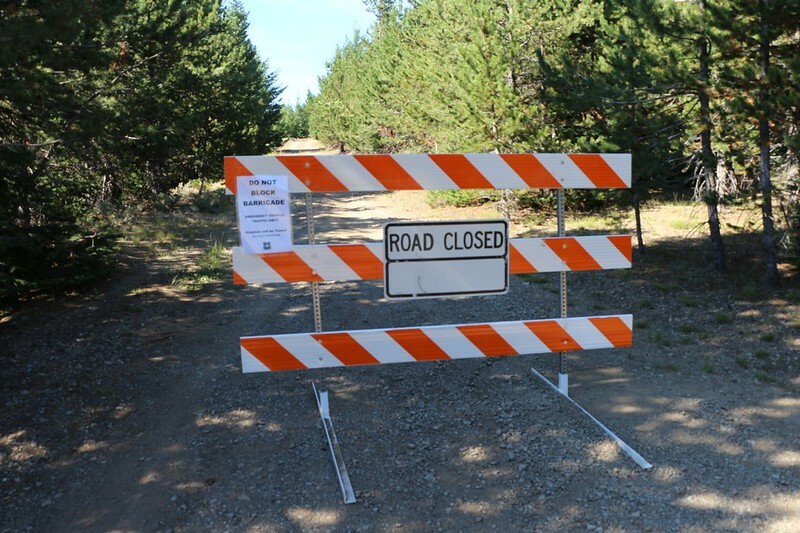 We arrived in Prairie City and found a warning sign at the start of the dirt road to Dixie Butte – road closed in five miles! Still, it said that “High Clearance 4WD Required” so that was rather concerning. There we were in a low-clearance sedan with two-wheel drive. But that’s never stopped us before. We drive in the desert all the time, and we were pretty good at it by now. All we had to do is drive slowly and carefully. If there was an impossible spot, well, we’d pull over and park right there, then hike with our packs the rest of the way. Yes, this four-wheel-drive road up a mountain was part of my Plan A, as crazy as that sounds. I had done all the research that I could online about the road, but there wasn’t very much. 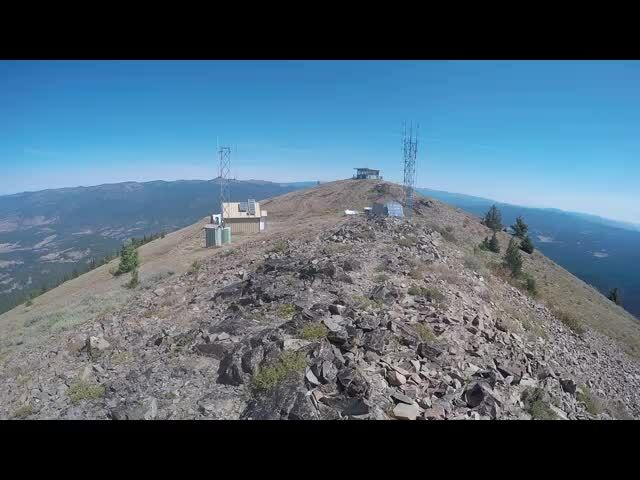 All I knew was that high clearance would be a good idea, and that there was a fire lookout tower on the summit of the mountain. This is what made me consider it, because they probably had to do some amount of maintenance on the road if people needed to man the tower. So we dared to drive up the mountain. 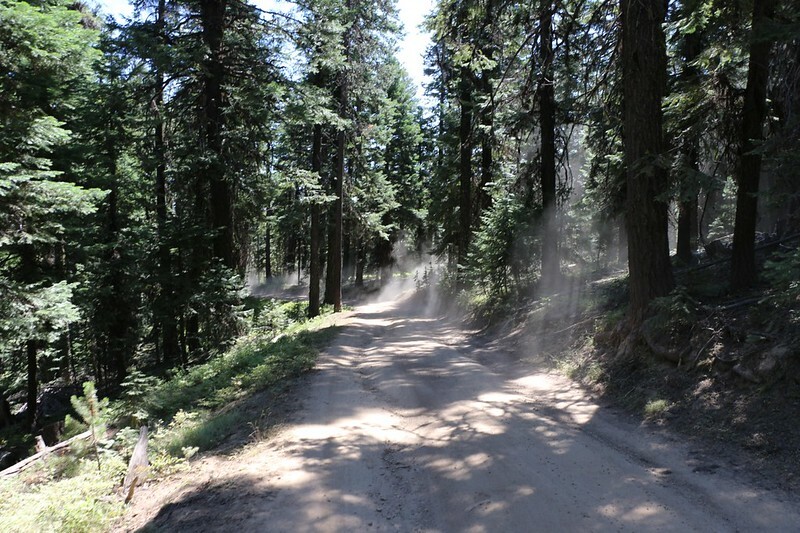 And, yes, there were a couple of tricky spots, but it was actually a darn good road. It was slow, but we made it to the intersection five miles up the road where they posted the official closure sign. Whoo hoo! We gave each other high fives, because now that we were up here there was no way that anyone was getting us to leave. Hooray for Plan A! It was only 3pm, so we had plenty of time to find a good spot to camp. 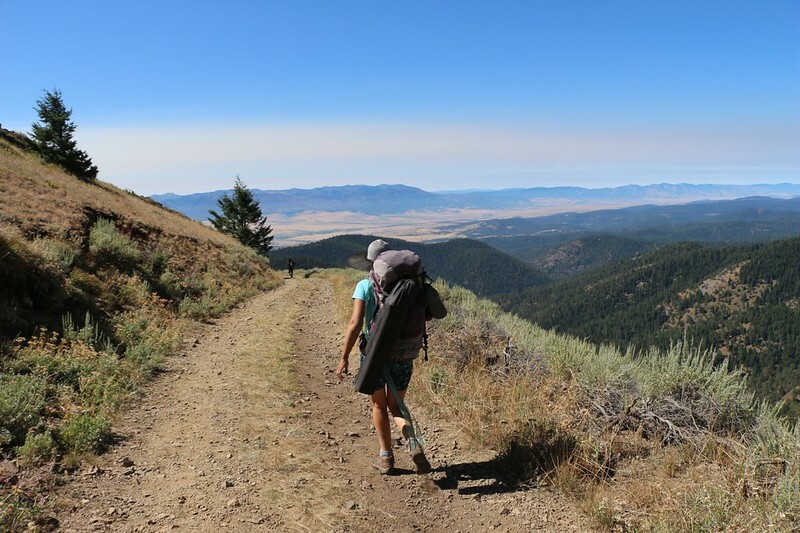 We double-checked that our backpacks were ready and then we hiked on up the closed road toward the summit. 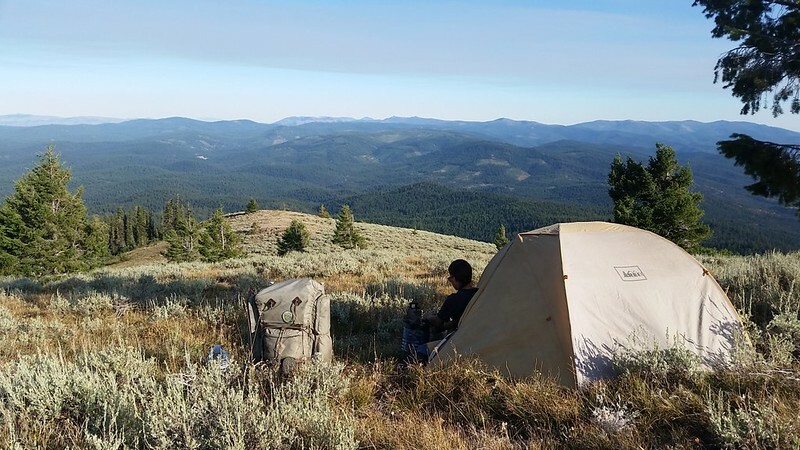 We had absolutely no idea where we would camp, but we wanted to get some solitude, and not stay directly on the summit. 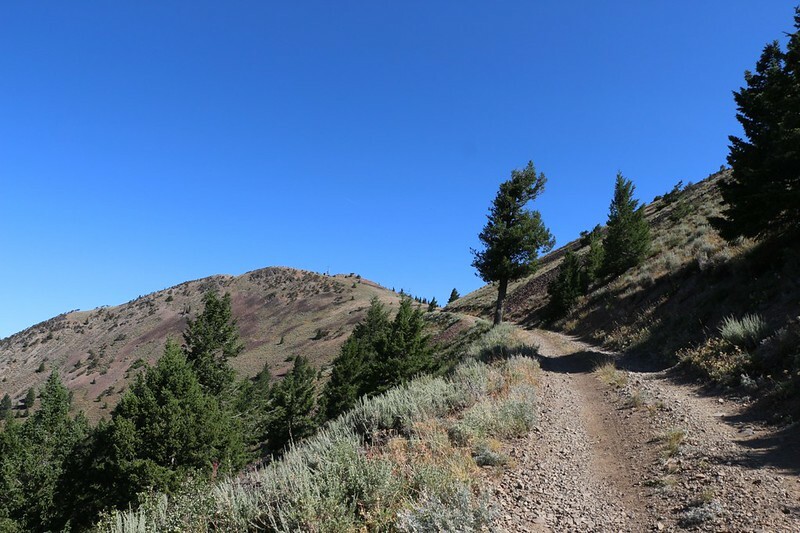 We hiked up the road and discovered that the mountaintop was a long, double-bumped ridge with only a few trees here and there. Surely we could find a campsite with all that grass! So we left the road and headed directly up to the ridgeline. What looked smooth and grassy from afar was actually much bumpier up close, full of clumpy low shrubs and plenty of sharp rocks. We set down the big packs and did a lot of wandering up and down the ridge. If we were going to stay here three nights it better be in a good spot. And everything was either too bumpy or too slope-y. It took forever, but eventually Vicki found a halfway decent spot next to a pine tree, which would provide afternoon shade. It was on a slope, but hopefully we wouldn’t slide down to the bottom of the tent in the night. After setting up camp, there remained one final detail: We needed to have enough water to last us three nights! There certainly wasn’t anything wet up here. But we were prepared. We’d purchased several gallons in a store on our way here. but they were still sitting in the trunk of the car. So I emptied my backpack and headed on down to the car. I loaded three gallons into the pack and walked back up the hill. It was tiring, but worth it. We stashed the water under our trusty pine tree and began to relax in a serious way. Vicki, meanwhile, had stayed in camp and set up her kitchen area. Upon delivery of the water, she whipped up some dinner, and them we sat down and read our books while eating. 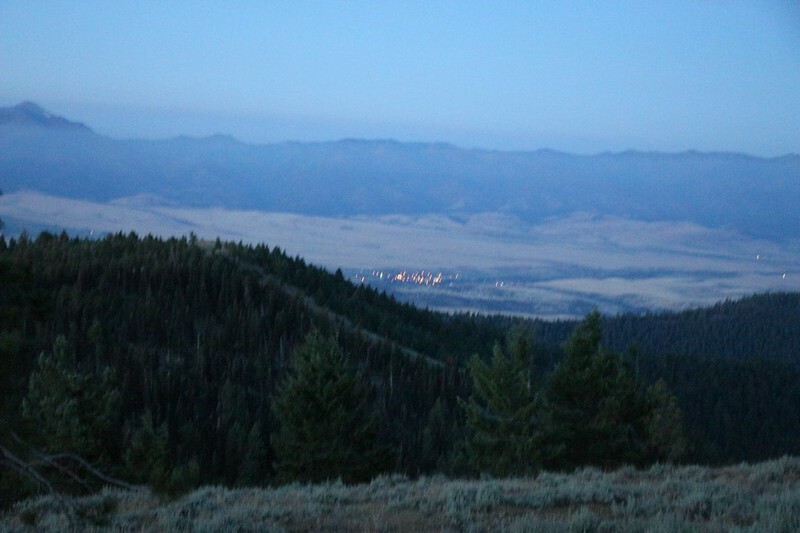 There was an expansive view to the east, south, and north from our campsite. It was truly an excellent spot. The road was over on the west side of the ridge, and the people camping down at the roadblock zone were far enough away that we could neither see nor hear them. This was the way we preferred to relax. With plenty of peace, solitude, and great views. It was a strange feeling to have nothing to do for three days. Here it was, Friday evening, and the eclipse wouldn’t occur until Monday morning. That’s a whole lot of time to relax. There were no pressing decisions to be made, so we wandered around our section of the mountain. 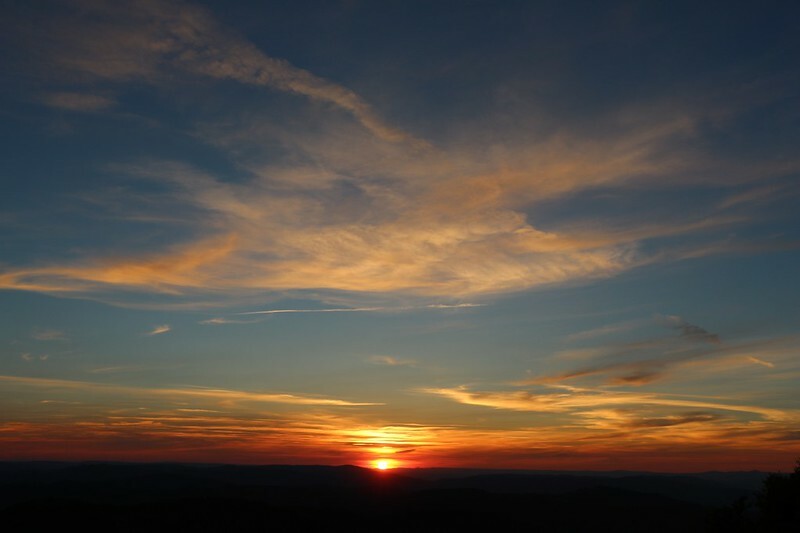 We took in the sunset by peeking over the ridgetop. There was a lot of smoke in the air, staining it a reddish brown. 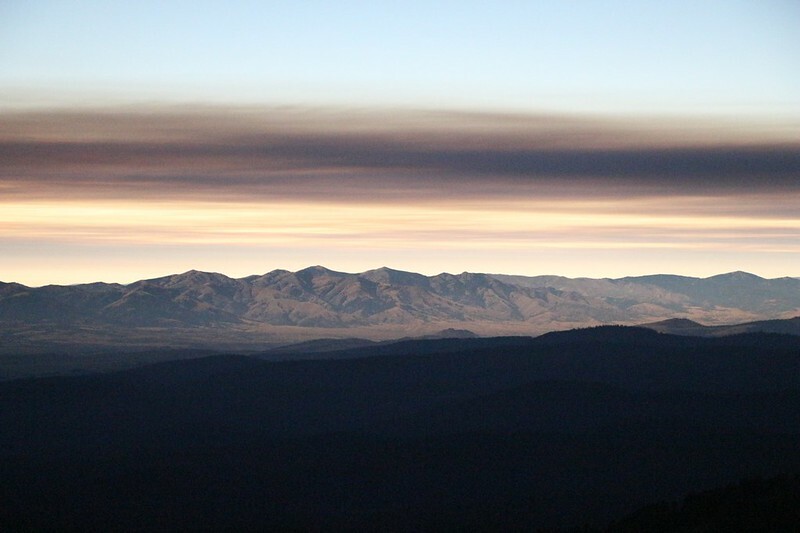 This smoke had drifted down from British Columbia, way up in Canada, where the forests were burning like mad after an unusually long dry spell. I checked my phone and it had plenty of signal up here, so I took some photos and texted them to our friends and family. I wanted to make them jealous of our awesome location, here in the Path of Totality, and I was successful. I hate to say it, but it was a good feeling. I decided to rub it in a few more times over the next three days. We woke up before the crack of dawn. Why? Because we foolishly believed the hype from the news articles, and were worried that a ton of people might come up here over the next few days. And all it would take would be one bad driver to block that dirt road resulting in us getting stuck up here. 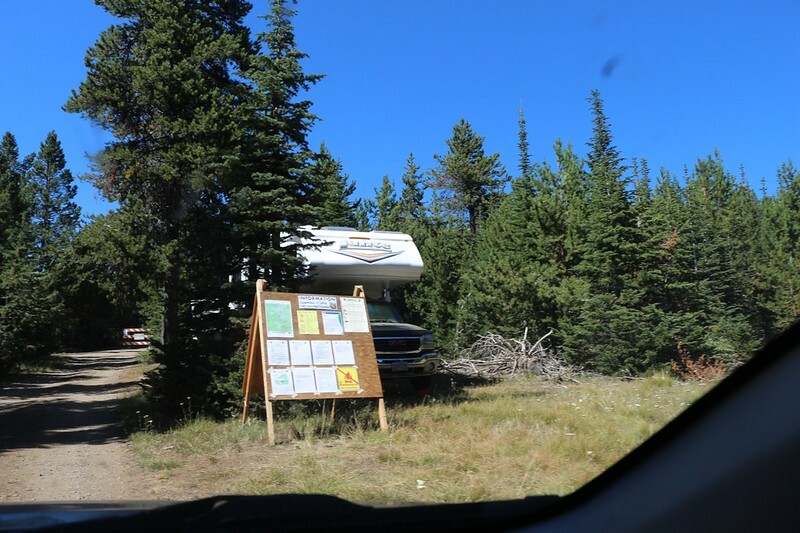 We realized that we could solve that problem, and gain a nice hike in the bargain, if we drove the car down to the bottom of the road and parked it near the other big RV’s that were already camping there. 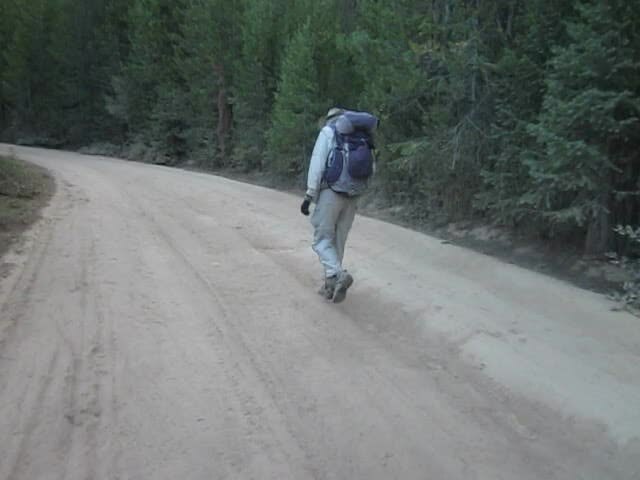 Then we could hike six miles (and climb 2300 feet) all the way back to camp while carrying only a light day-pack. This would keep us busy and give us something to do today. 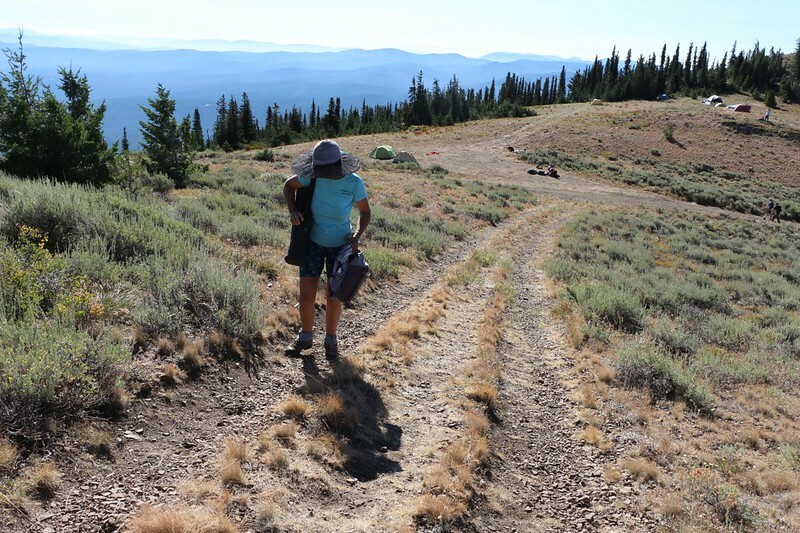 And when the eclipse was over, well, we’d have to carry our heavy packs, but at least it would be downhill all the way. And that would provide some extra time for the exodus traffic to moderate. Since it was only a one lane road, we decided to head downhill early, to avoid any uphill-bound cars. So that’s why we woke up at 4:30 or so, and headed back to the car with a day-hike’s worth of gear. Then we drove on down the mountain. There were already a bunch of cars parked near the highway, so we felt OK about leaving ours there. 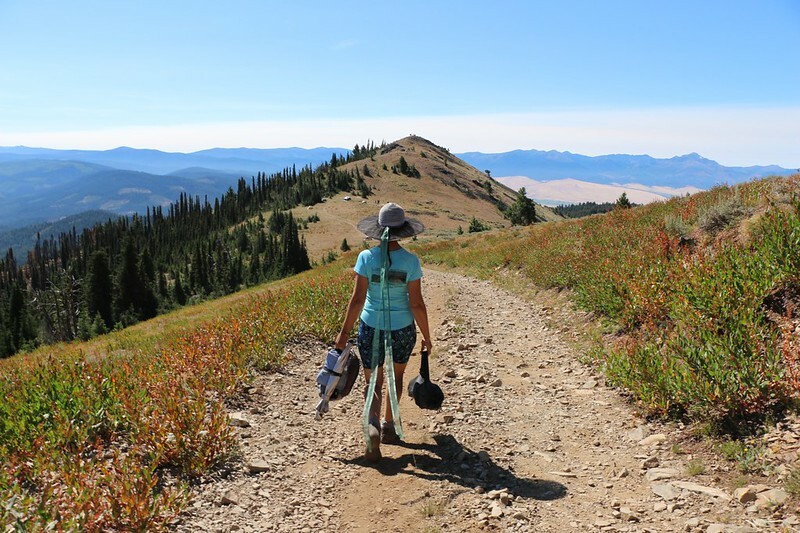 We could smell bacon and eggs cooking as we started hiking and we were jealous. Those car campers really knew how to camp luxuriously! But soon enough we left them behind and had the entire road to ourselves. It was too early for most folks to show up, although a couple of trucks went by. We did our best to stay on the upwind side when they passed, because the soil here was very dusty and their tires stirred up major clouds. But mostly we were alone. It was a fun hike, and we had a chance to check out a number of camping spots along the way. It was a good climb, but because we were travelling so light the time went by very quickly. Soon enough we were back at the roadblock. 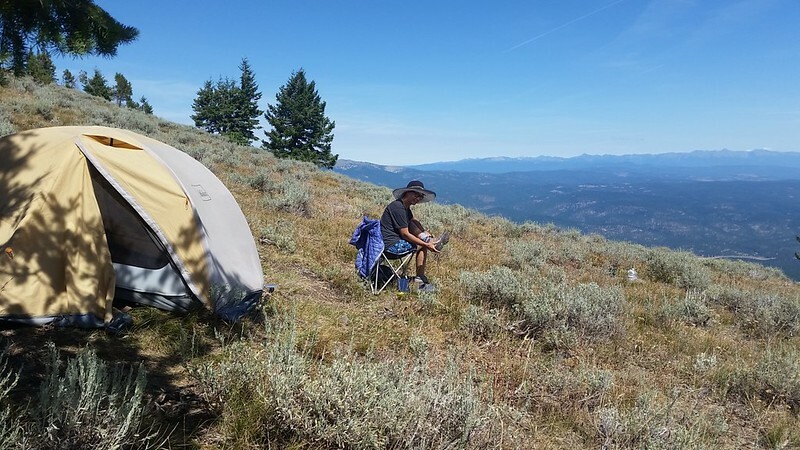 And this time we actually read all the rules and fine print on the newly-posted signs, and were relieved to realize that our tent was beyond the 1000-foot-radius “forbidden zone” for camping at the summit. We were still feeling strong as we climbed the final closed section of road toward our camp, and decided to continue on to the summit, in order to check it out before the eclipse. That way we could decide precisely where on the ridge we wanted to view it from. 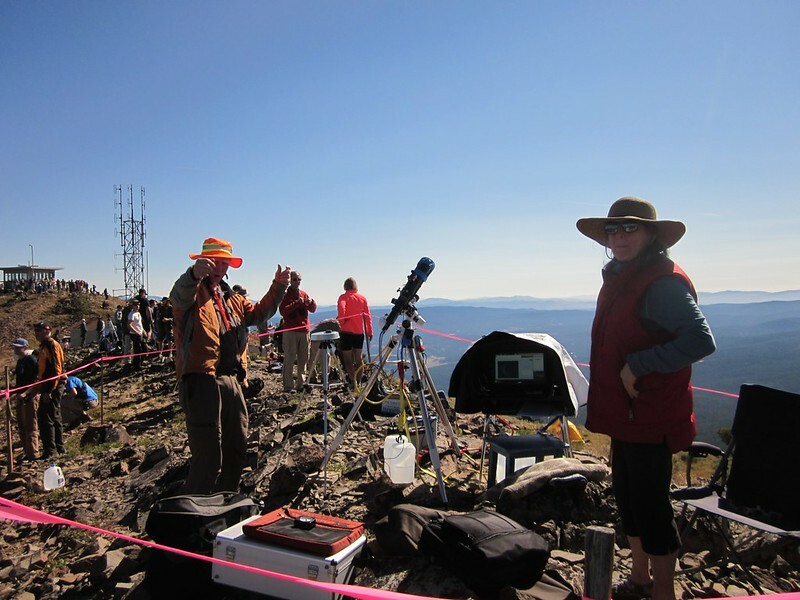 Plus, we heard from some fellow campers that there were “scientists” up on the top with their telescope. 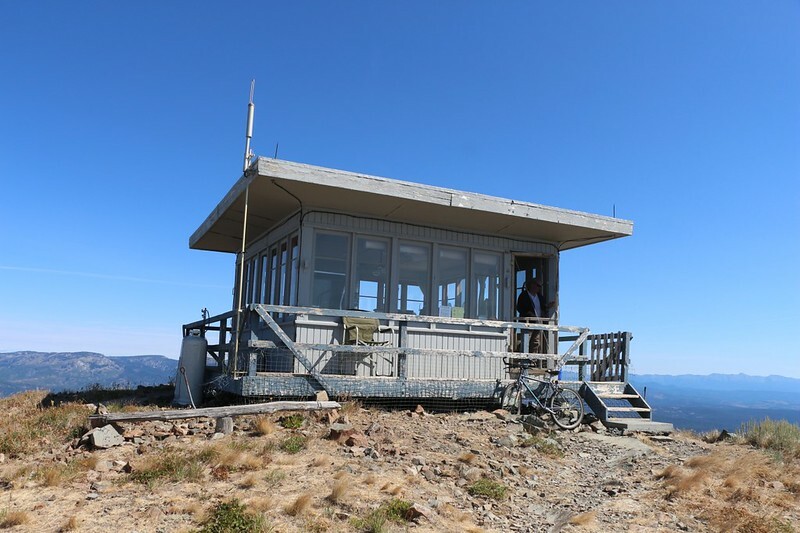 And there was also a fire lookout tower. This all sounded like fun, so up we climbed. We climbed a very steep road directly to the top, and visited the lookout tower, which wasn’t a tower at all. It was a window-lined cabin sitting on the ground. 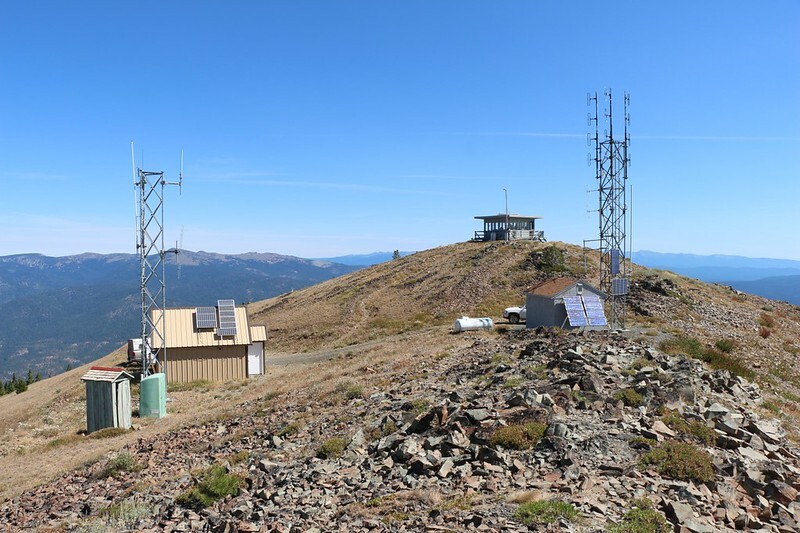 We spoke to the Forest Service Ranger who was stationed there for a while, and viewed the transit and some maps on the ceiling that two neighboring towers would use to triangulate the location of a fire. She seemed a bit nervous about the crowds that might show up for Monday’s eclipse, as this “glass house” was also her bedroom, but there wasn’t much that any of us could do about it. She decided that the best thing she could do was try to enjoy it. 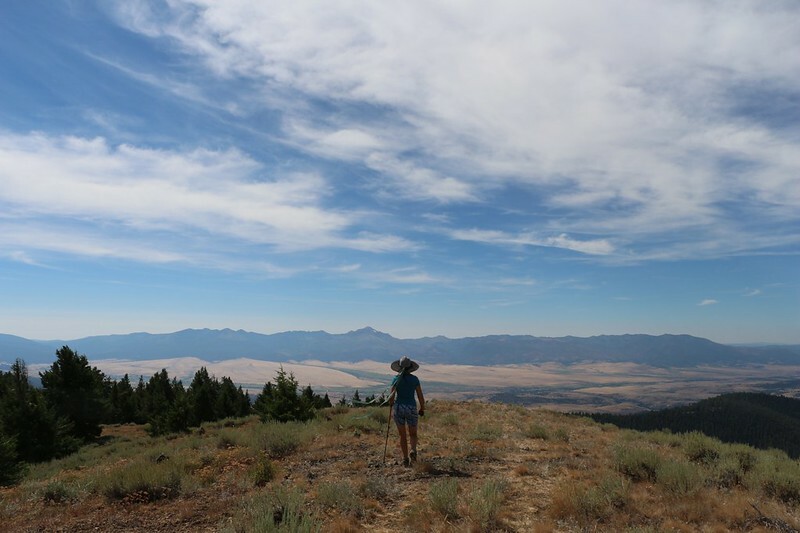 After that, it was time to visit the other, lower summit on the long ridgetop and check out the “scientists.” It turned out that an amateur astronomer named Joe Earp was there. 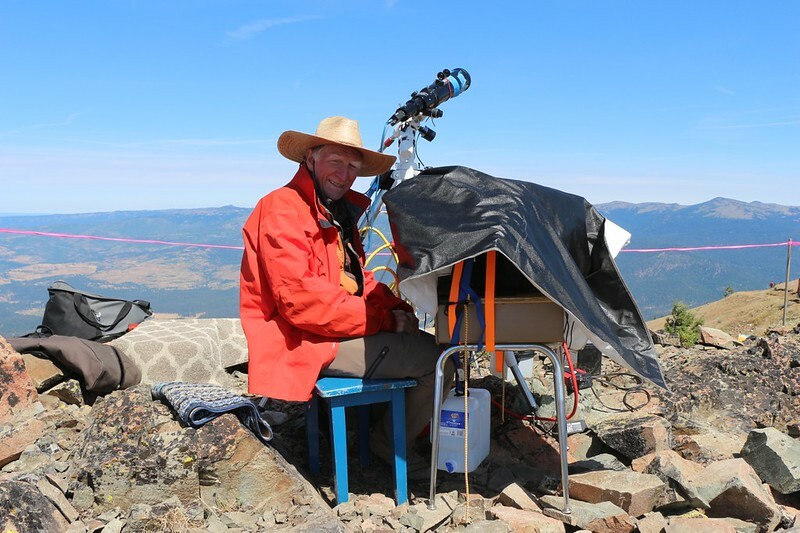 He had a solar telescope and a laptop computer on a small desk set up on the rocky summit. The tripod and desk were weighed down for stability against the wind by heavy jugs of water. We spoke to him for quite a while. 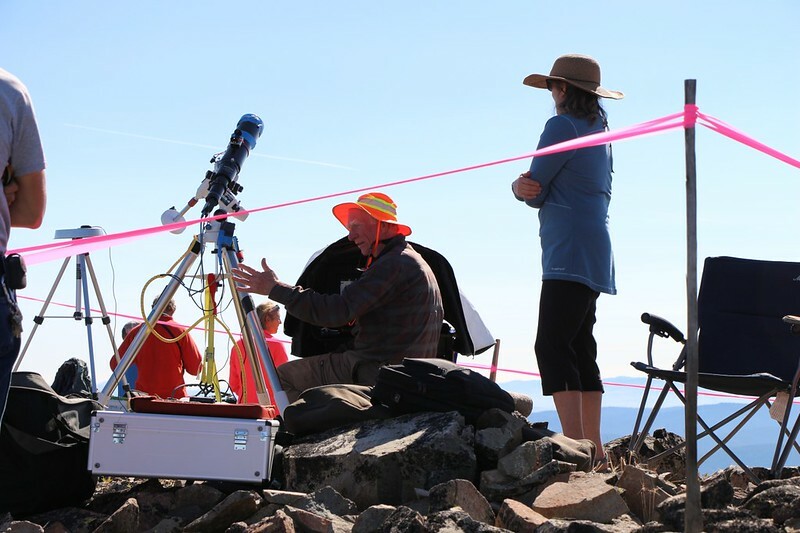 He was working with the Citizen CATE Experiment, and was one of 68 astronomers with identical telescopes that were strategically positioned along the 3000-mile path of totality across the entire country. By combining their images, they would be examining changes within the inner solar corona over the ninety minute timespan that the eclipse would take as the shadow of the moon passed across the continent, even though each location only saw totality for a two-minute interval. 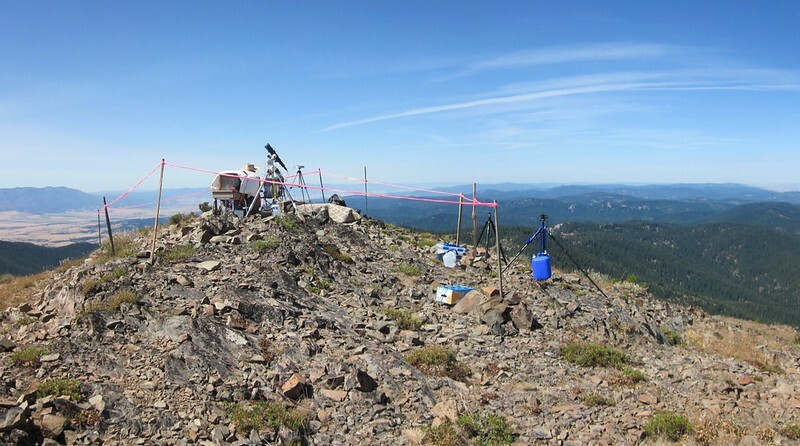 He had an official permit from the National Forest Service to be there, so he was able to keep a small section of mountaintop roped off for his own use, to prevent crowds of people from interfering with his observations. Read the NSO webpage for more details on his equipment and the experiment. He was up here early in order to do a few “dry runs” with his equipment, to make certain that everything worked without a hitch on the big day. 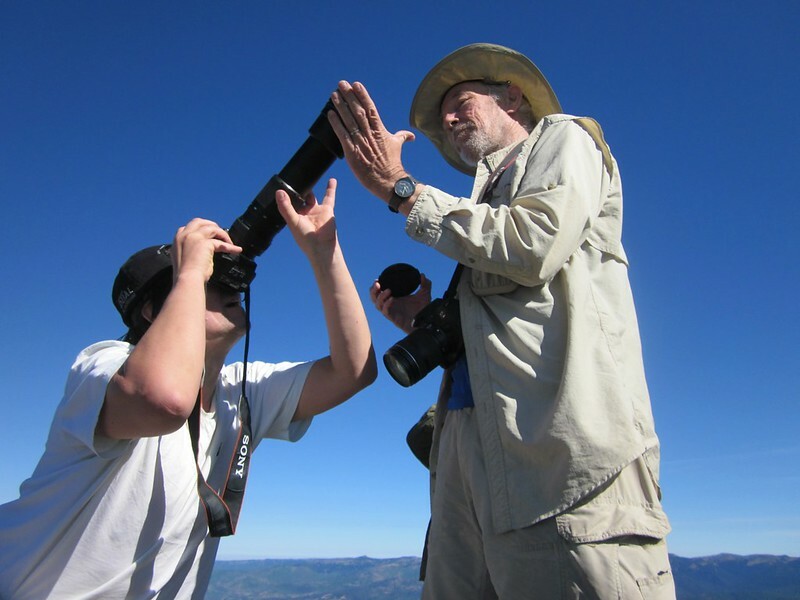 We had quite a good conversation up there on the mountain about some of our own outlandish astronomical theories. It’s always fun to speak with intelligent people who have a sense of humor. We left Joe to his dress rehearsals, and headed back to camp. We took the main road down from the summit, which was less steep. It circled around the north side of the mountain, so we saw some new views. As we walked, we decided to spend the day of the eclipse in Joe’s general vicinity. 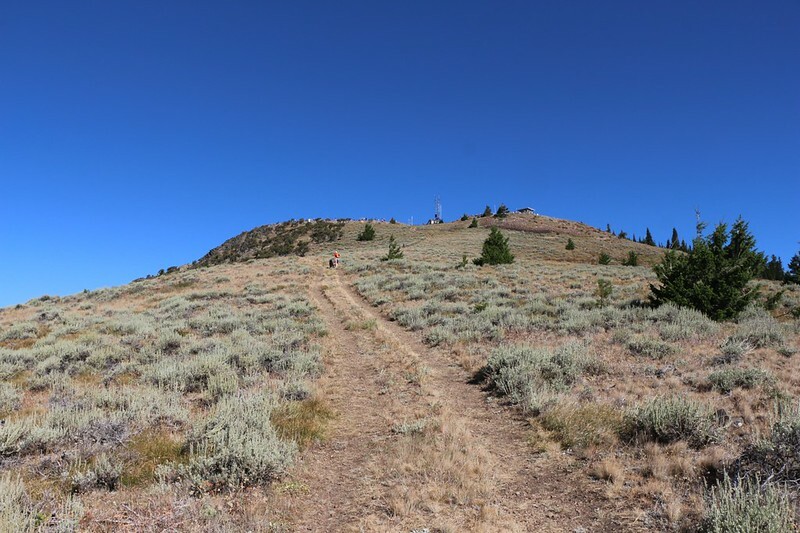 When we reached the saddle below the summit, I looked at my GPS and discovered that our tent was at the same exact elevation, but around on the opposite side of the lower, southern summit. Rather than climb up and over the ridge from the road like yesterday, we decided to walk around the east side, so that no climbing would be necessary. Vicki truly liked this idea. She’d had enough “up” for one day already. And it worked out really well! There were a couple of convenient deer trails that were easy to follow, and there were no cliffs or other surprises. Just an easy walk back to camp. 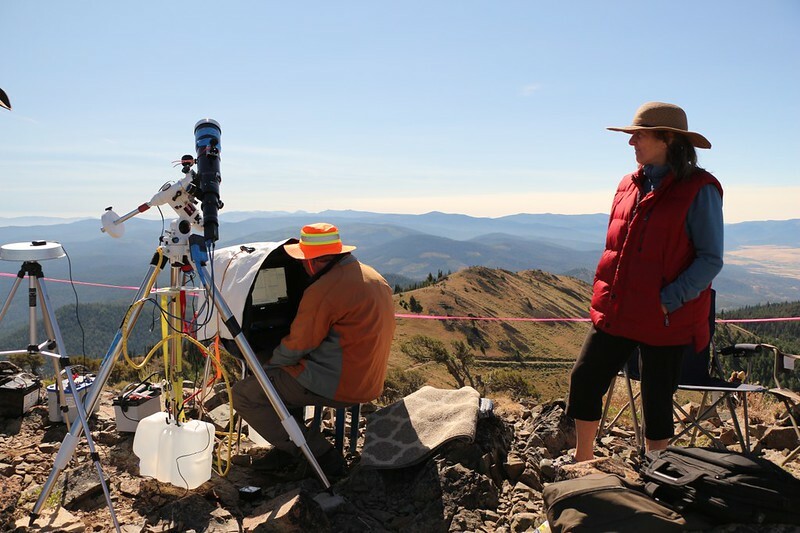 Vicki carried her folding chair all the way up here – she wasn’t going to get a stiff neck looking up at the eclipse! We got back to camp by one pm, which was much earlier than we’d expected. And we had absolutely nothing planned for the rest of the day. Indeed, up here on Dixie Butte there wasn’t all that much to do. Except eat lunch and read books and take naps and enjoy the views of the distant mountains. So that’s exactly what we did. For hours and hours. I took a few more pictures of the beautiful sunset and sent them off via my phone to the family. I didn’t want them to worry that we weren’t enjoying our vacation enough. We realized that we still had all day Sunday with nothing scheduled, so we looked at the map and tried to come up with a plan. There was another, even smaller summit bump further down the southern ridge that we were presently camping on. Maybe we could bag that tomorrow. It was just beyond the road closure, only a mile or so away. It would give us something to do besides lazying around all day. And then we went to bed, with no plans to wake up early this time. More sunset colors with just a touch of smoke. Still hoping that the weather clears up by Monday! I woke up early anyway. I think I was getting used to waking at first light. 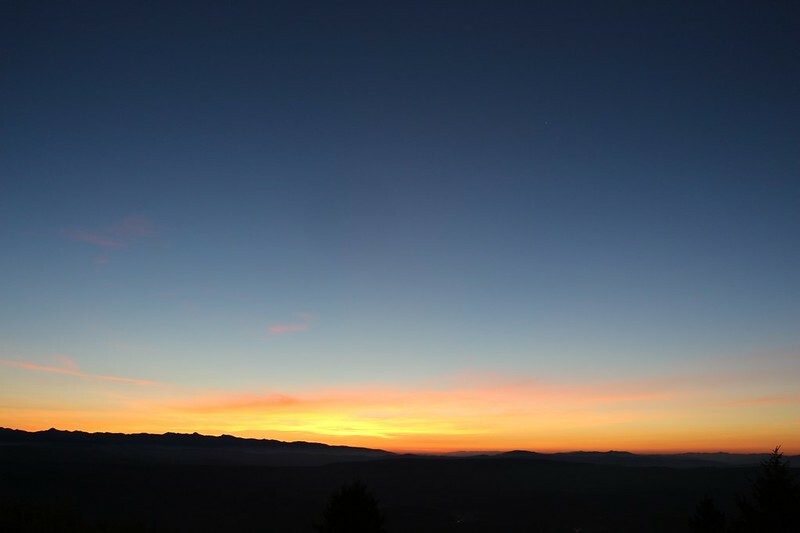 I pulled on some clothes and went outside with my camera to check out the sunrise. There were far less high clouds than yesterday, but still more than I would have liked. It was fairly cool out there, and Vicki had no intention of getting up, so I went back into the tent. I read my book for awhile, but soon got tired. Maybe sleeping in was the best idea after all. We had a very slow morning. We ate breakfast and read our books. I checked out the weather forecasts on the internet, and they seemed promising, predicting clear skies the next day. Eventually, we decided that we were being far too lazy, so we stuffed our lunch and some water into a day pack and headed on down the hill. We decided to climb that other peaklet and check it out. Down at the flat area near the roadblock we discovered dozens of people camping. Everyone was hanging around enjoying themselves. It was actually getting a bit crowded. Although I originally didn’t think much of the roadblock, now that I’d wandered all around the area I changed my mind. It really was the best spot. 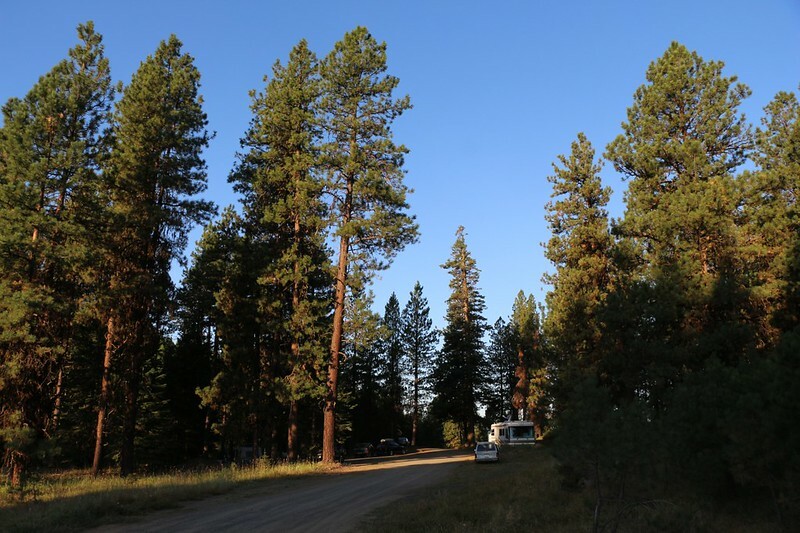 The Malheur National Forest officials made the right call. Allowing all of those cars up to the summit would have been a very bad idea, traffic-wise. Plus, there wasn’t much space to camp up there, and the soil was too rocky for the most part. Down here in the saddle there was room to spread out, with plenty of smooth spots for tents. Good planning yields good results, and everyone seemed happy. Of course, we we even happier not camping near all these noisy people, but we didn’t tell them that. 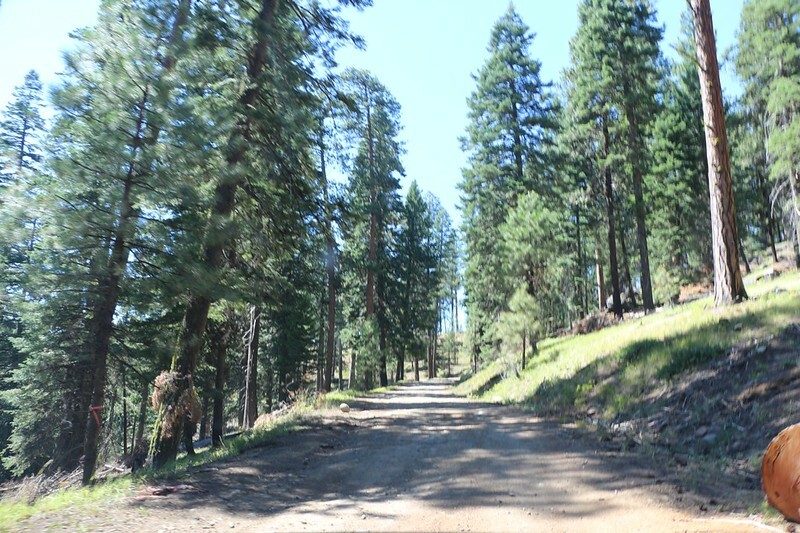 We continued onward along an old, disused forest road that led us toward the bump. It was only 200 feet higher than the saddle, but that was enough for better views. 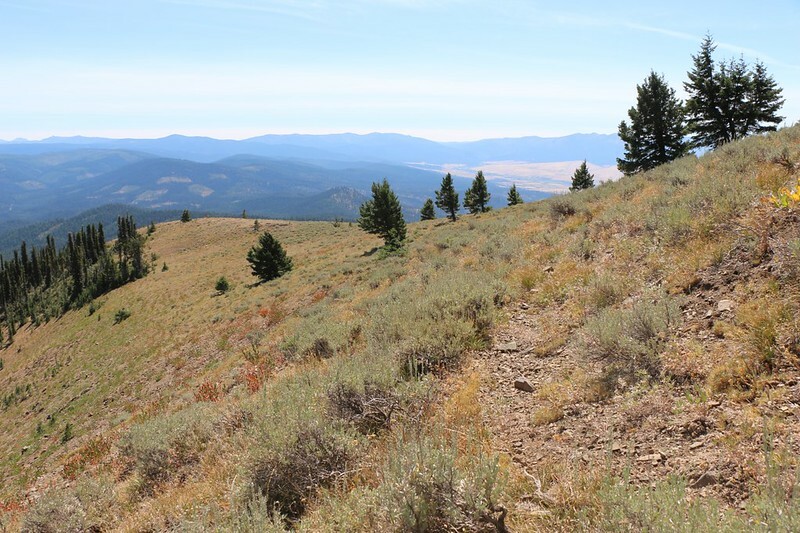 We were able to look back toward Dixie Butte and also got fine views south toward Prairie City, which was roasting in the sun several thousand feet below us. That was another reason why this mountain was part of Plan A. The typical daytime temperature down in the valley was in the nineties, which was far too hot for us. But camping 4000 feet higher would drop those temps down into the seventies, which was more our style. And it worked! Thus far, every day had been perfect. We climbed onto the rocky ridge top of the bump and brought out our books and lunch. It was time to do some additional relaxing. We hung out in the warm sun as a gentle breeze cooled us off. It was very peaceful. Eventually, our legs got stiff from sitting and we decided to head back to camp where we could lie flat on our backs while reading. 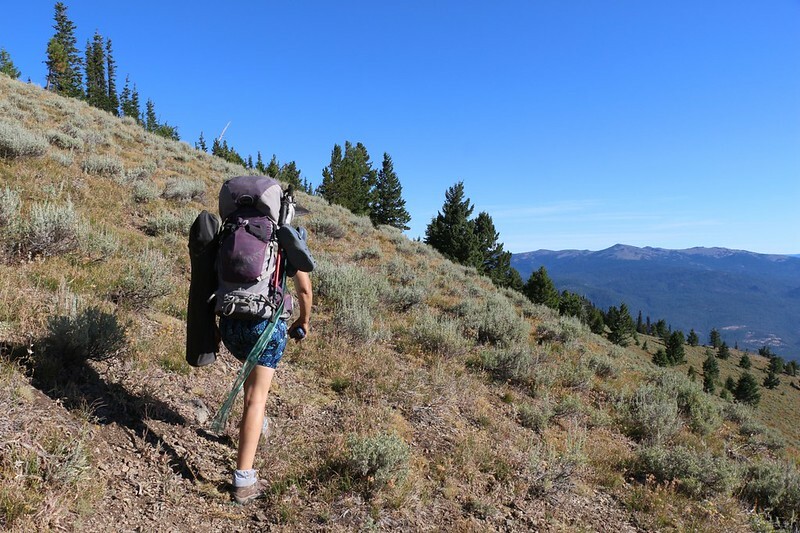 It had been such a short and easy hike that we took the long way around the ridge to camp, just to get in a bit of exercise. As we hiked, more and more cirrus clouds kept forming and drifting across the sky. They were very pretty, photographically-speaking, but we really wanted them to go away. Just because the weather models said they would be gone by the time of the eclipse didn’t make me very confident, for some reason. But there wasn’t much we could do about it anyway, so we enjoyed their beauty while we were here. 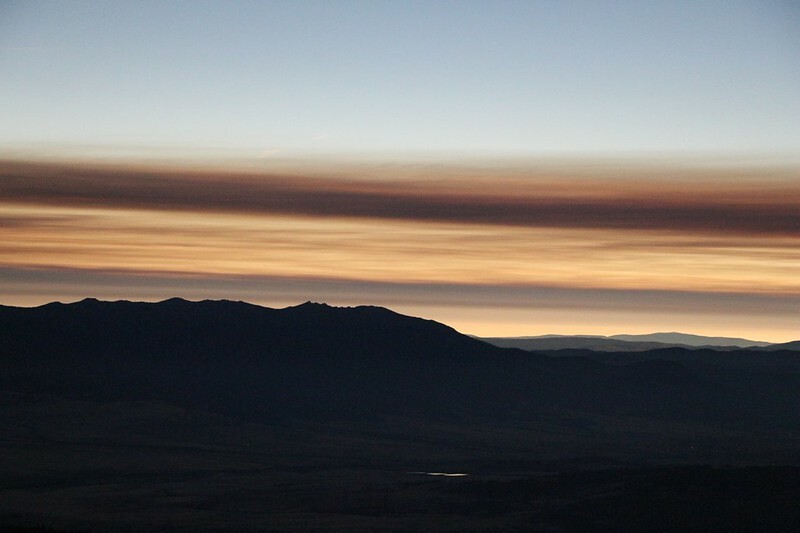 High clouds over the John Day River Valley from our camp. That dark bump left of center is where we ate lunch. We hung around the tent for the rest of the afternoon. And, yes, we took a nap or two. After dinner, we enjoyed another sunset, and headed to bed. Vicki fell asleep right away, but I’d been napping so much that I couldn’t get back to sleep. I read my book with my headlamp until eleven o’clock, which is quite late for me, especially when camping. I’m still not quite sure whether it was the naps, the quality of the book, or thoughts of the upcoming eclipse that kept me awake. But I fell asleep in the end, and that’s what mattered. 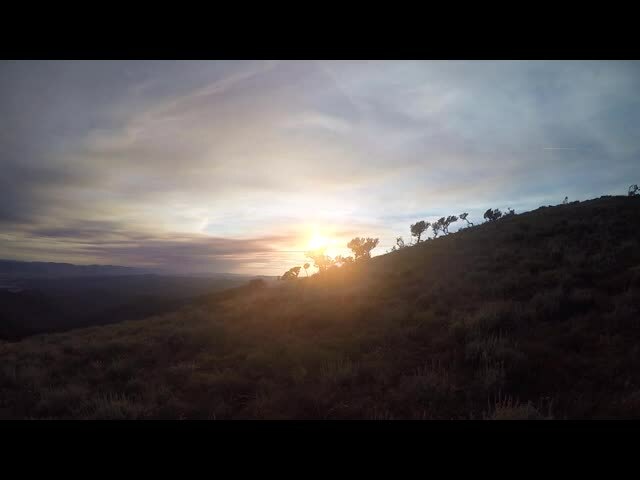 Our third sunset on Dixie Butte – tomorrow morning would be the Solar Eclipse! We woke up as soon as the tent started getting light, just before dawn. We were excited. Today was the big day! And look! The skies were mostly clear, just like we wanted! Oh, yes, life was good again. We got dressed and began to pack up. We were done with this campsite, as nice as it was. We fell back into our usual backpacking routine, and soon enough we’d eaten breakfast and everything was completely packed. We had a bit of water left over, so I walked around and poured water on a few choice bushes near the campsite that may have gotten a bit stressed due to our visit. Camping in that spot wasn’t quite “Leave No Trace”, but we left it as pristine as possible. We put on our packs and took a last look around. Everything was packed. Good-bye beautiful campsite! 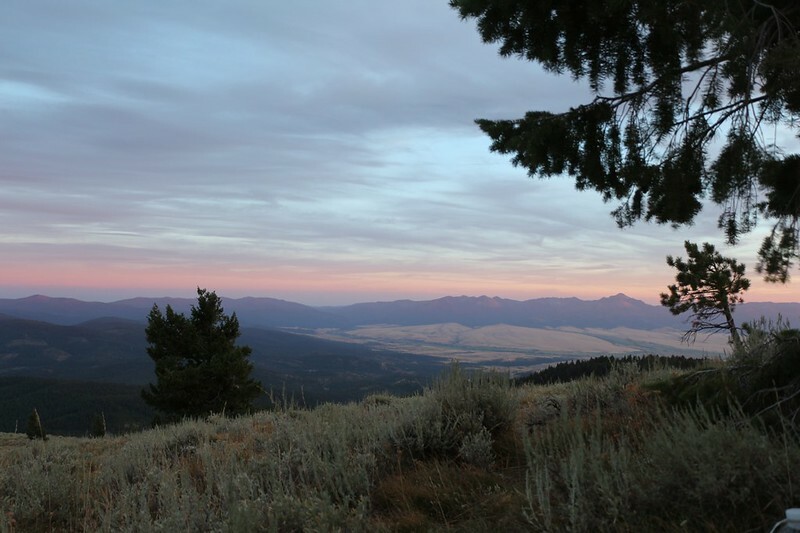 Our third sunrise on Dixie Butte – only a few more hours until the Solar Eclipse – Time to pack up! 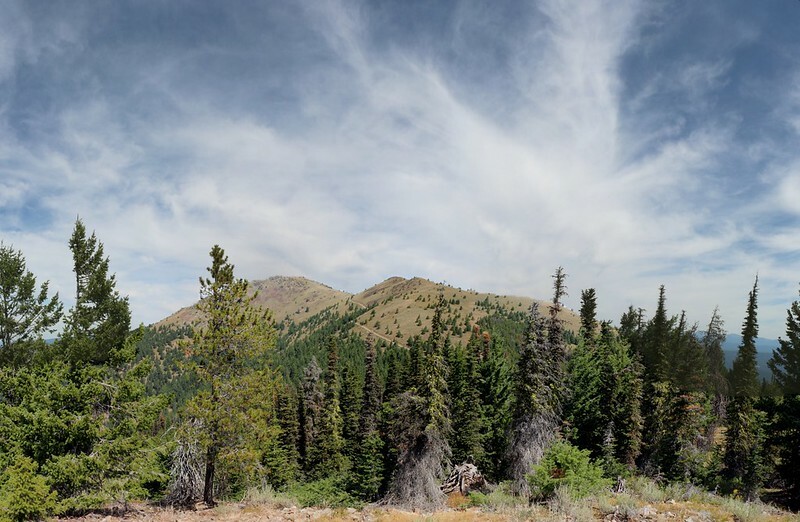 We walked around the ridge to the saddle below the peak, and stashed our backpacks in a stand of trees. 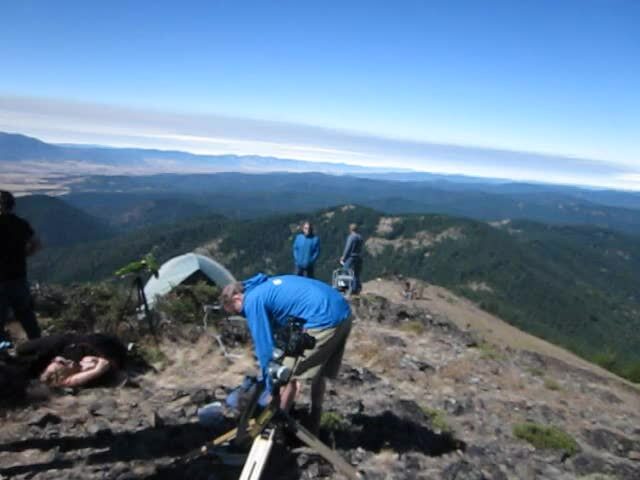 We grabbed what we needed for eclipse viewing (cameras, batteries, snacks, water, Vicki’s chair, and, most important of all, our Solar Eclipse Glasses) and headed on up to the summit. We took the steep, direct route. It was slow hiking, and we took many rests on the way. We could see at least a hundred people up there above us, strung out in a line along the ridgetop. It was looking to be quite a party! We were about an hour early for totality (at 10:24am), but technically the eclipse had already begun. While resting and catching our breath, we whipped out the eclipse glasses and looked through them directly at the sun. Yep, there it was, the arc of the moon. It was just beginning to eat its way across the sun. 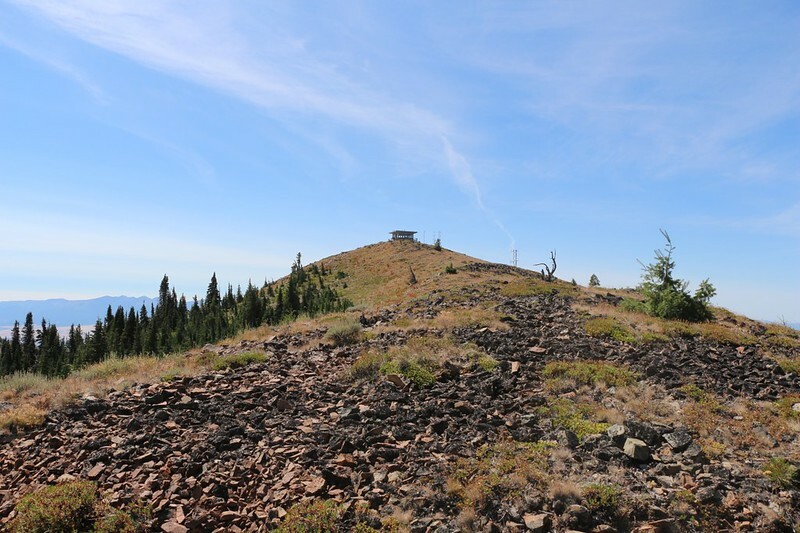 We reached the top and headed left toward Joe Earp and his telescope. We found a spot on the rocky ridge just south of him. We said hello to our new eclipse-neighbors and Vicki set up her chair. The views were great and the sky was clear, though possibly a bit hazy off near the horizon. But it was good enough for us! 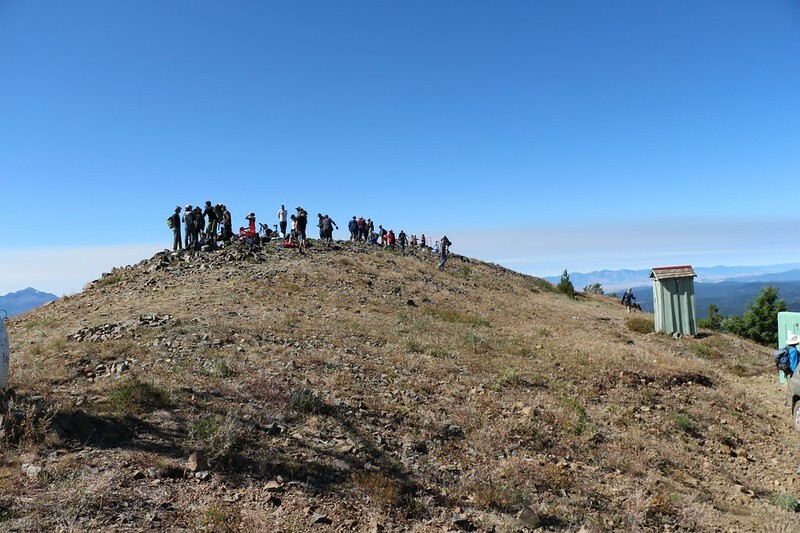 Panorama shot of the Dixie Butte summit ridge about an hour before the solar eclipse – lots of people! Everyone was having fun, talking about the eclipse and craning their necks upward to look at the sun through the special glasses. Everybody understood that you had to wear the glasses both before and after totality to protect your eyes from too much ultraviolet light. 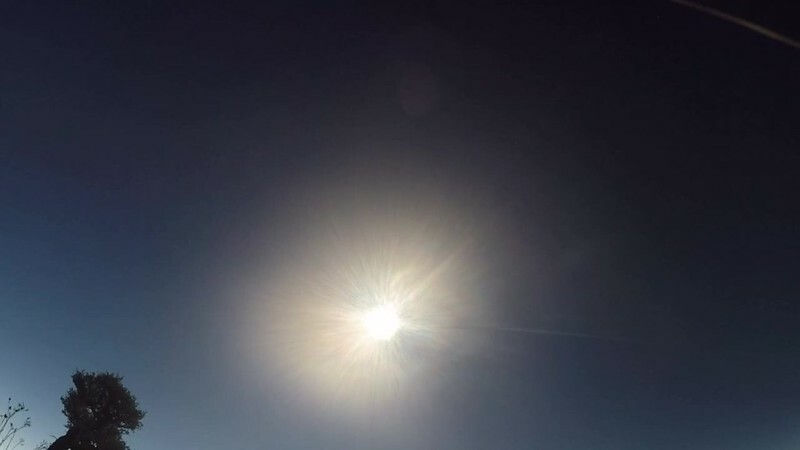 Only during 100% totality should you risk staring directly at the sun (although, technically, you’d be looking at the dark side of the Moon, not the sun at all). 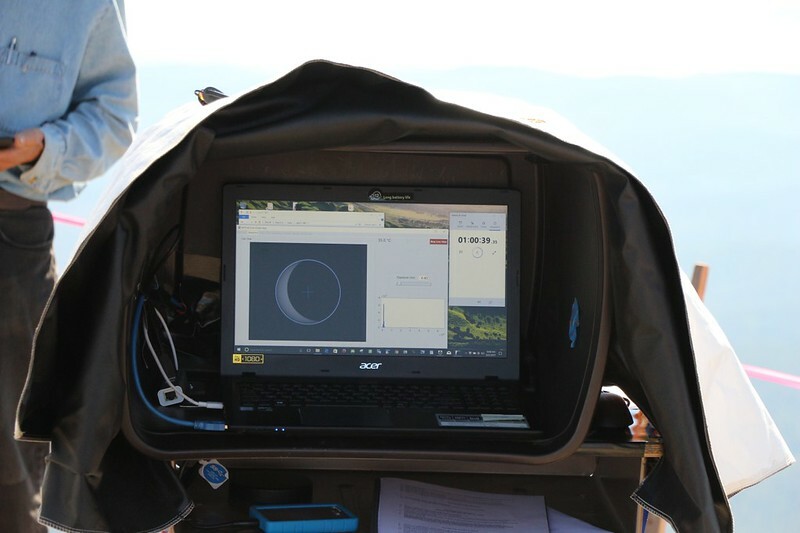 I had also brought along a silver mylar solar telescope filter. I tried taking a couple of pictures with it placed over my camera’s lens, but they came out less than satisfactory. Not that it mattered all that much. I may be an amateur photographer, but I had no interest in getting serious about taking photos of the sun’s corona. No, my goal, as always, was to take photos and videos of what I, myself, was seeing, or doing, or experiencing. 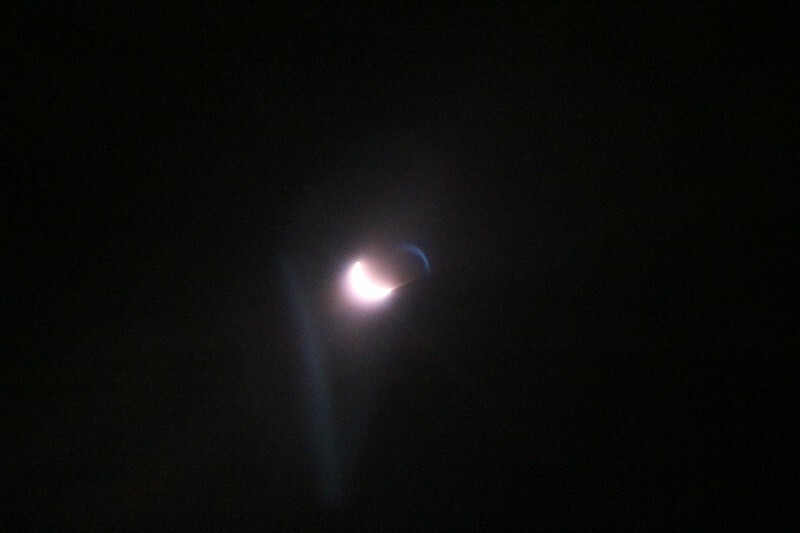 There would be plenty of eclipse photos, taken by better photographers than I, available for viewing online afterwards. 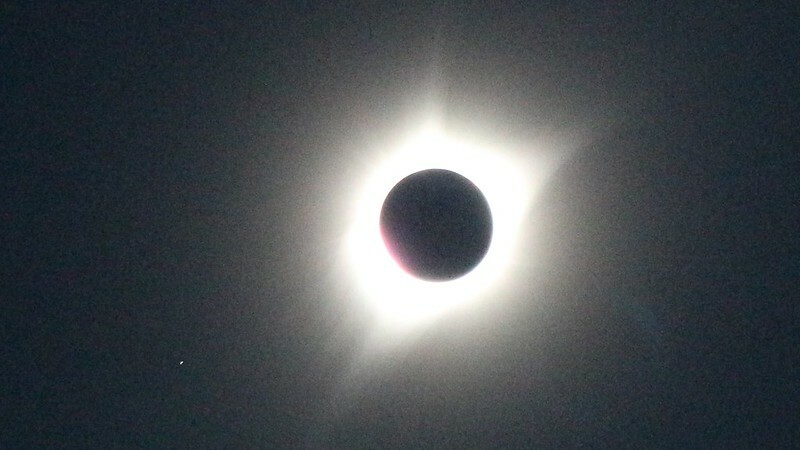 Let’s face it: Totality was only predicted to be two minutes long, and I wanted to spend every second of it looking around with my own two eyes. While waiting, I took photos of the people on the ridge, and checked out Joe’s setup, but I left him alone as he was quite busy making sure that everything was perfect. There was only one chance at getting it right. I told some neighbors about other partial solar eclipses that I’d seen as a child, and how my dad had brought out a huge box and poked a pinhole in the top, so that we kids could get inside it like a fort and view it safely on the wall of the box; we were essentially sitting inside our very own camera obscura. They didn’t get it until I showed them, using my hand, what a pinhole camera lens was all about. 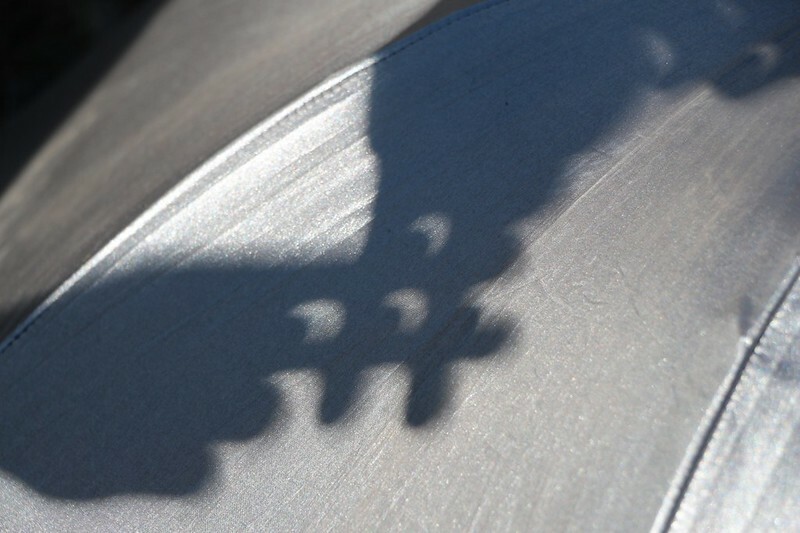 Soon, we were all making crescent-shaped shadows with our fingers, and we noticed that even the leaves on nearby bushes were casting smiling shadows. We were having a good old time. As the moon crept slowly across the sun, the world slowly got dimmer. The air grew colder, as well, which made plenty of sense but was still quite astonishing to us. Vicki was only wearing shorts, and, since all of our warm clothing was way down below in our packs, she had no choice but to sit and shiver. 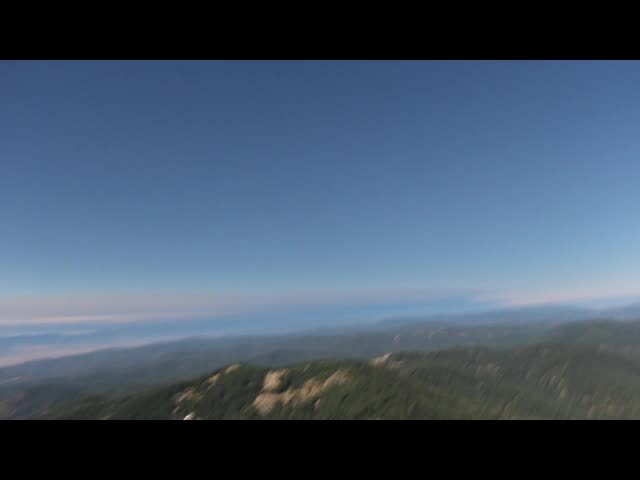 With only a few minutes to go, I powered on my GoPro video camera and walked down off the ridge. I placed it on a sloping rock and started recording. This was as far as I was willing to go toward photographing the eclipse itself. Then I climbed back up and rejoined the crowd. As the time drew near, everyone’s gaze was aimed to the west. The shadow of the moon was coming from that direction. It was predicted to be travelling well over 2000 miles per hour, and was about 70 miles in diameter. It was extremely fuzzy around the edges, of course. In fact, we had technically been in the “fuzzy zone” for the last hour, so we weren’t going to see a sharp-edged shadow moving in such a dramatic fashion, like a supersonic freight train travelling east at Mach 2.5 (which truly would have been incredible). Just the same, it was dramatic enough from up here on the mountaintop. Vicki was the one who noticed it first. 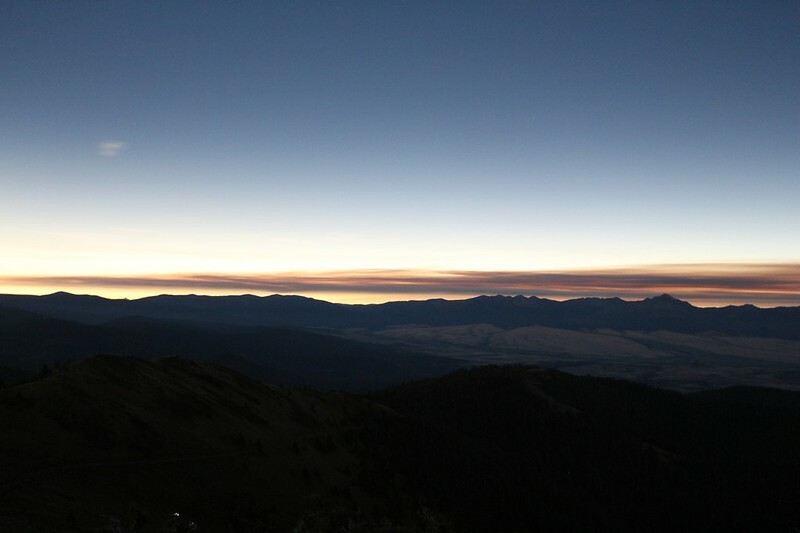 The high clouds far off in the west had gradually grown dark. People began murmuring and speaking amongst themselves as a general hush fell over the ridgetop. 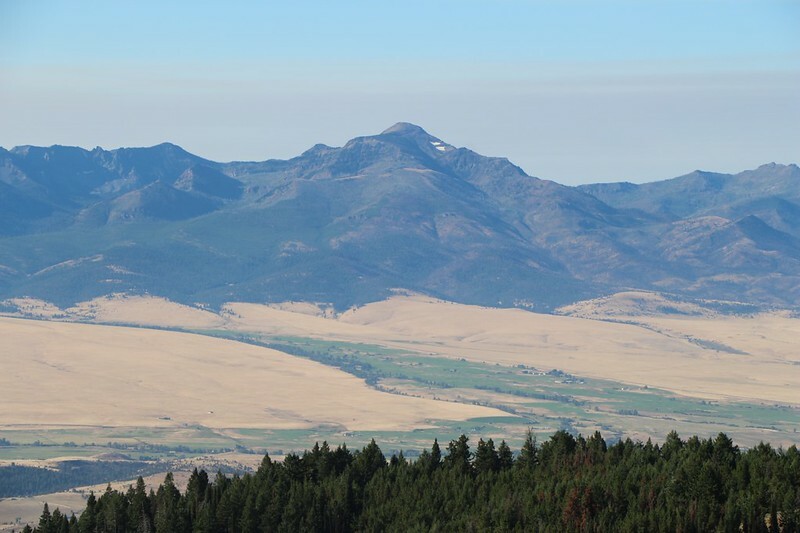 Soon we noticed that the Aldrich Mountains, a range about thirty miles away to the west southwest, began to grow dark, followed by the grassy-floored valley below them as the shadow headed for the town of John Day. It was coming! It would be here any moment! It was dead quiet at first, and then a cheer gradually sprang up from the crowd. People whipped off their glasses and gazed upon the sun’s corona with their naked eyes. It was fiery all around the dark circle of the moon. And there were several stars to be seen in the heavens, shining bright in the middle of the day! I gazed all around. People’s phone screens were shining bright, but it was still light enough to see everything. 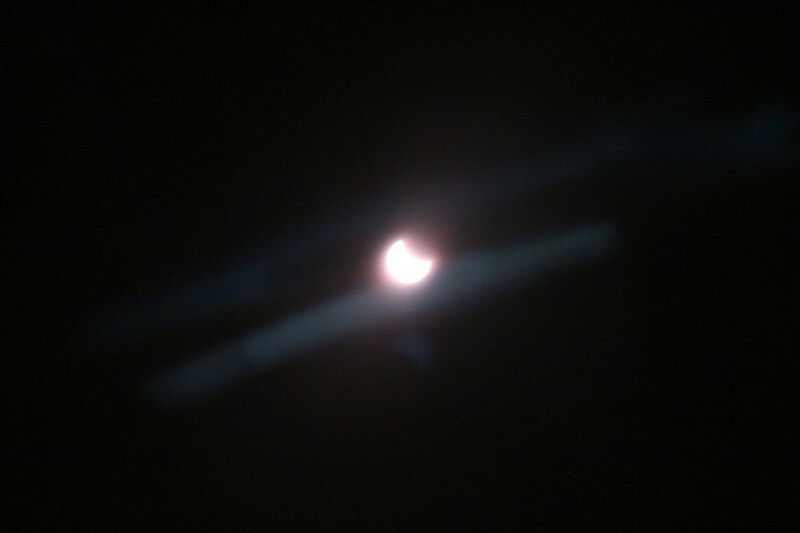 It was much brighter than a full moon, thanks to the corona, but it was still quite dark, like nighttime, nonetheless. There was a ring of distant brightness shining just above the horizon in every direction, as if sunrise was about to happen from everywhere at once. We were packing as much sensory experience as we could into these two distressingly short minutes, but just the same we knew that the end was coming as those distant mountains began to get lit by the sun. Soon the plains down below in Prairie City were turning bright. That was the signal for the “Diamond Ring” photo op. 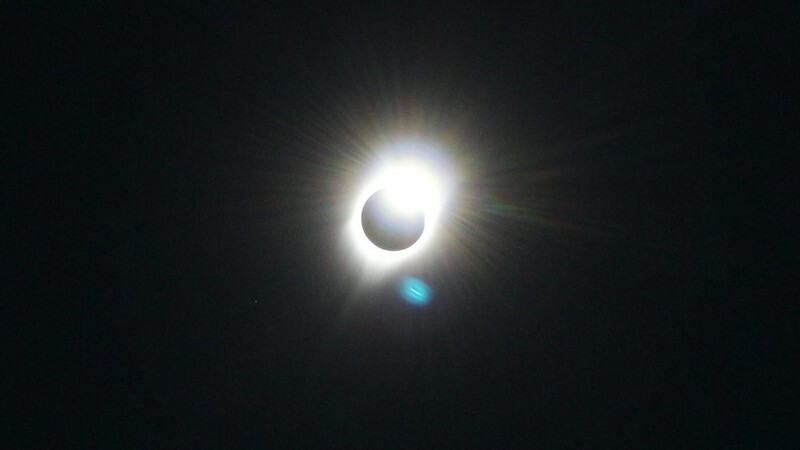 The first point where the sun breaks out and begins to shine along the bright circle of the corona is reminiscent of a diamond ring, hence its name. I turned off my video and took a quick snapshot, then began the video again, as I had been doing earlier during the two minutes of totality. I was a few seconds too late for the best diamond effect, but that’s the way it goes. 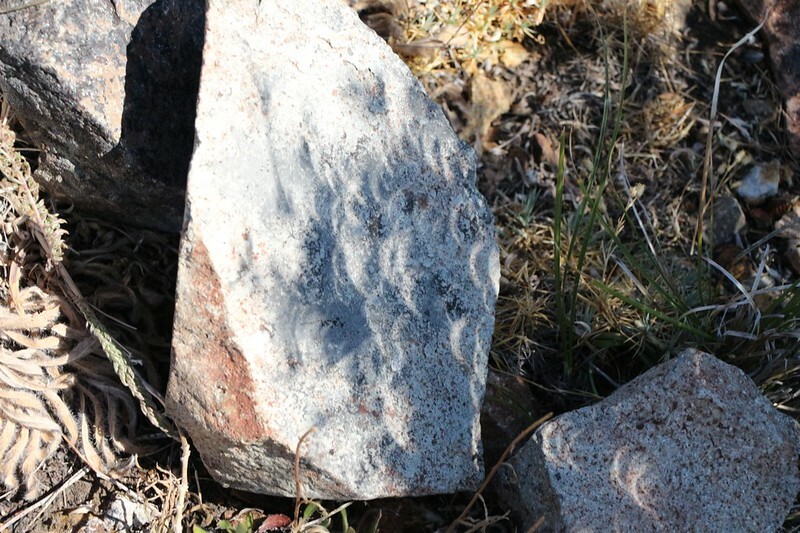 Although there was still another hour or so left until the moon finished passing in front of the sun, this partial eclipse phenomenon was visible from anywhere around here. No mountaintop was required. Meanwhile, it was still cold. 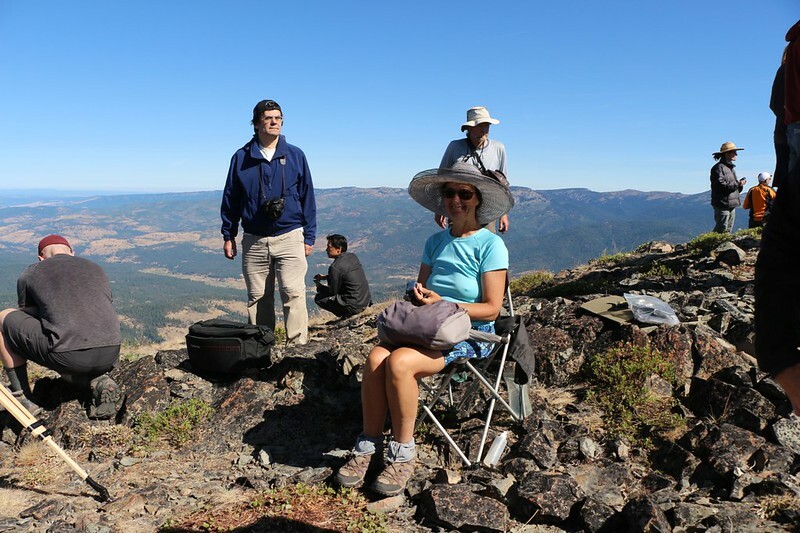 We decided that hiking would warm us up, so Vicki packed up her chair and away we went. Once again, we took the long road down from the summit. 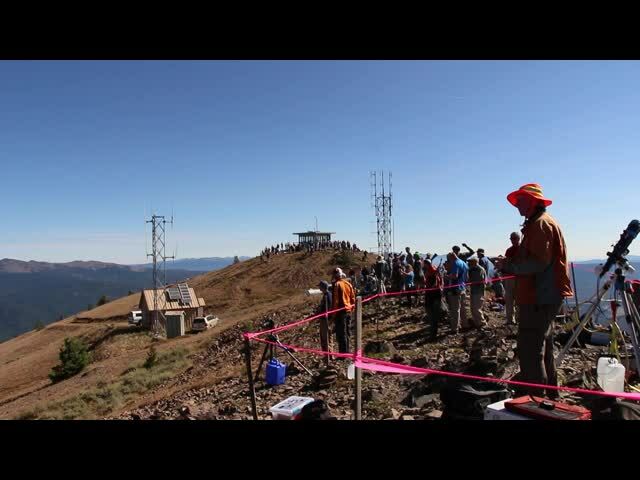 We got to see all the people strung out along the ridge to the north of the lookout tower. Everybody was still hanging around having plenty of fun, and looked to be in no rush to leave. This suited our purposes perfectly, since we had to walk all the way down the mountain. If there was a mass exodus of cars on the road while we hiked, our lungs would become choked with dust. We picked up our big backpacks from our stash-spot and began the long hike downhill. Even hiking fairly quickly, that six miles would take about three hours or so, but we were ready for it. We had lunch and water and snacks, and were in no real rush to get out on the road. We had a fifteen hour drive ahead of us to reach San Diego, and we planned to take it in shifts, with one of us sleeping and the other driving. Hiking downhill through the forest sounded a lot more pleasant than driving, so we took our time. Amazingly enough, less than a dozen cars came down the road while we hiked. Along the way we took a shortcut through the forest which saved us from a long boring loop. That’s where we stopped to eat lunch, as far from the dust and noise as possible. We took off our shoes and socks, and let our sweaty feet be happy in the breeze, and got out our books but didn’t read them. This was probably our last moment of peace before heading back to civilization and we wanted to savor it. As we ate, we talked about this whole eclipse thing. 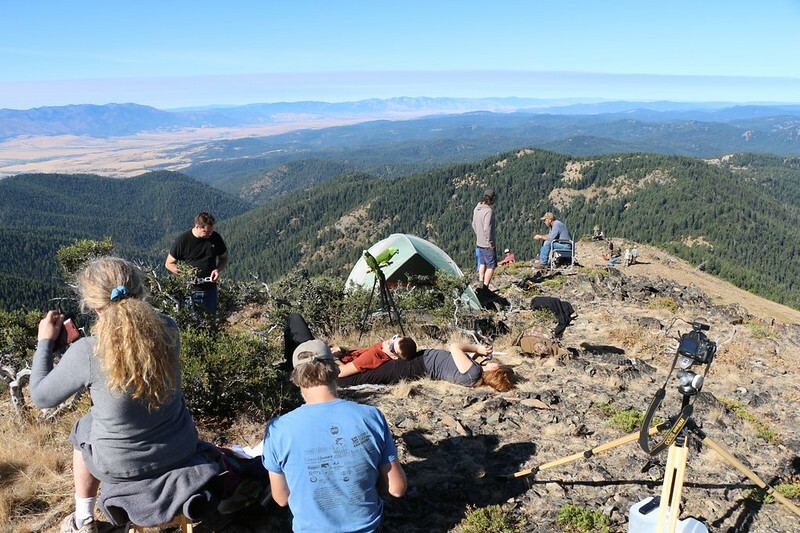 Was it worth it, to have spent three days and nights on a lonely mountaintop doing little or nothing the entire time in order to experience two short minutes of a total solar eclipse? We wished that we hadn’t listened to all the hype about traffic, insofar as Eastern Oregon was concerned. 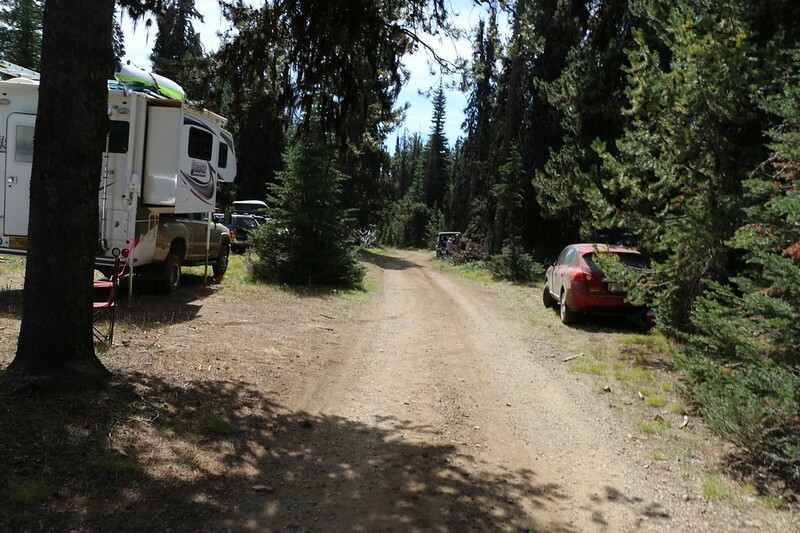 With 20/20 Hindsight, we could have planned to arrive on Sunday, spending only one night on the mountain, and we certainly didn’t need to drop our car off down at the bottom of the dirt road. But we didn’t know what would happen, so we made the best decisions we could. All in all, we really enjoyed the time spent hiking and reading and napping up there. As for the Eclipse? Yes, it was truly excellent, though far too brief. it was one of the most amazing natural phenomena we’ve ever witnessed. And, in the end, it was worth the three days. Yes. Absolutely. We would do it again in a heartbeat. We loaded our gear into the car and got ready for the 15-hour drive back to San Diego – goodbye Dixie Butte!